Blueberry juice is a delicious beverage packed with health benefits – in fact, there are at least 10 of them, which we are going to outline for you in a moment. Blueberries in general have been hailed for their nutritional content along with being powerful antioxidants. Now that the warmer weather is upon us and blueberries are coming back for the season, here are 10 benefits of blueberry juice you should be aware of to entice you into eating more of these healthy berries. Lose weight: A study conducted by the University of Michigan found that blueberries can aid in weight loss. Blueberries were found to help reduce fat in rats regardless of the diet they were on. Researchers believe that blueberries have an impact on the way our body stores and breaks down sugar. Although the study was conducted on rats and more research on human subjects is required, there are previous studies suggesting similar results. Slow down the aging process: Thanks to its high antioxidant count, blueberry juice can help fight off free radical damage that speeds up the aging process. In one study, participants consumed blueberry juice combined with apple juice for four weeks. The researchers found that oxidative DNA damage – which promotes aging and increases the risk of cancer – was reduced by 20 percent. Pack on antioxidants: As mentioned, blueberries and blueberry juice are high in antioxidants, which fight free radical damage. Blueberries are noted to offer the highest amount of antioxidants, compared to other fruits. Aside from fighting free radicals, antioxidants have also been linked to improved overall health. Lower blood pressure: Studies have found that blueberry consumption is associated with a reduction in blood pressure. After eight weeks of consuming 50 grams of blueberries a day, high-risk heart disease patients experienced four to six percent decrease in blood pressure. Prevent heart disease: Because blueberries can aid in hypertension, they can also help reduce the risk of heart disease as well. Blueberries are known to reduce the risk factors related to heart disease, but more research is required to determine if they can reduce the risk of heart attack or stroke. Boost brain health: Free radicals and oxidative stress can damage the brain, but the antioxidants in blueberries can help combat this, thus contributing to improved brain health. A six-year study consisting of 16,010 elderly found that consuming blueberries and strawberries delayed cognitive impairment by 2.5 years. Manage diabetes: Blueberries are fairly low in sugar, which makes them a healthy snack for diabetics that won’t increase the blood sugar levels. Blueberry properties have also been shown to benefit insulin control and sensitivity, which can be easily achieved by drinking blueberry juice. Treat urinary tract infections: Cranberry juice is often hailed for aiding in urinary tract infections, but blueberry juice can benefit the treatment as well. Blueberries and cranberries are closely related and share the same active ingredients that help treat a urinary tract infection. Just remember to drink a natural blueberry juice and not the cocktail variety, which is packed with sugar and can worsen the condition. Relieve muscle damage after strenuous exercise: After an intense workout, muscles may get tired and sore, but this muscle fatigue can be improved with the consumption of blueberry juice and blueberries. Blueberries can help reduce inflammation and oxidative stress on the muscles, thus speeding up muscle repair. Support eye health: The antioxidants in blueberries can aid in eye health by preventing free radical damage to the eyes and the ensuing vision problems. Blueberries also aid in blood pressure, which is a contributing factor to poor vision as well. If you’re convinced that you should be consuming more blueberries more often, then here are some healthy blueberry juice recipes you can enjoy to start receiving all the benefits that blueberries have to offer. To make blueberry juice, put blueberries in a saucepan and pour in water to cover the fruit. Heat the berries to a boil. Mash the blueberries with a wooden spoon while the fruit is still in the water but the heat is off. Boil the blueberry mash. Once boiled, remove from heat. Strain the blueberry juice from the blueberry pieces, and use the wooden spoon to smash any remaining blueberries. Taste the juice and add a natural sweetener as per your taste. 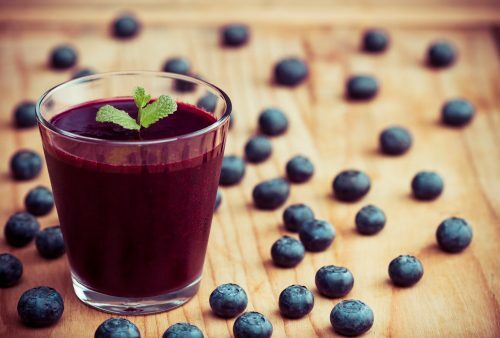 Now that you have your very own homemade blueberry juice, you can start improving your health daily with all of the benefits these wonder berries have to offer.